There have been two players named Betancourt throughout the course of major-league history, and it just so happens that both of them are current. Far more has been written about Yuniesky Betancourt than Rafael Betancourt, even though Rafael has been around longer, and even though Yuniesky is terrible. But then, that’s kind of the reason. Yuniesky wasn’t supposed to be terrible, but he became terrible, famously terrible, and he kept getting jobs. Rafael is a reliever who has been quietly effective for relatively unpopular teams for the better part of a decade. It never didn’t make sense that more should be written about Yuniesky. But some should be written about Rafael, because it turns out he’s more interesting than you probably thought. Full disclosure: I’m obsessed to a minor degree with Rafael Betancourt. I find him to be absolutely fascinating for reasons that might not appeal to the average baseball fan. There’s something particular about the way that Betancourt goes to work. He hasn’t hit a batter since his rookie season way back in 2003, many hundreds of appearances ago. That’s crazy, and I’ve written about that elsewhere. But that’s a symptom. It’s not that Betancourt tries not to hit batters; it’s that he pitches in such a way that hit batsmen are almost impossible. Especially, specifically, against lefties. Betancourt is not a one-pitch pitcher. Against lefties, he throws a fastball, a change, and a slider. 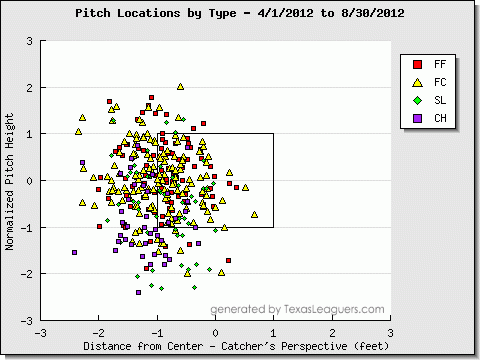 But while Betancourt is able to mix up his pitches, he doesn’t exactly mix up his pitch locations. While he does vary height, everything — almost literally everything — is away. Nearly every single pitch he’s thrown to a lefty this year has been over or beyond the outer half. Some pitchers try to live on both the edges. Against lefties, Betancourt lives on just one of them. It’s always been this way, or at least it’s always been this way to a high degree during the PITCHf/x era. We can’t go back any further than that, but odds are the way Betancourt has pitched is the way Betancourt has always pitched. The inner half of the plate goes almost entirely unexplored. 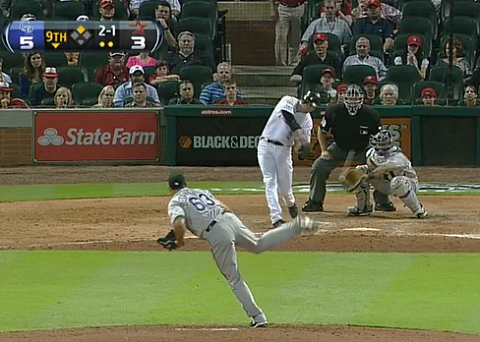 Here is the very most inside pitch Betancourt has thrown to a lefty all season long. It’s from the season opener, in Houston. The very most inside pitch. And based on the catcher’s glove movement, it wasn’t supposed to be an inside pitch at all. It was supposed to be more away, like all the rest of Betancourt’s pitches, and Betancourt just missed. The chart above is a testament to how good Betancourt usually is about hitting his spots. The very most inside pitch. It was an inside pitch, definitely, in that it was not an outside pitch. It was also a strike. The furthest inside Betancourt has thrown to a lefty this year was still within the strike zone. Interestingly enough, check out pitch number 5, which came immediately after pitch number 4, as is always the case. That’s the fourth-most inside pitch Betancourt has thrown to a lefty this year. Once again, it wasn’t supposed to be that far inside, and Betancourt just missed a little in. Two of Betancourt’s four most inside pitches to lefties so far in 2012 came consecutively in the same plate appearance in the season opener. I haven’t checked, but I can’t imagine there are many pitchers who leave areas of the zone as unexplored as Betancourt does, if there are any of them. Strangely, Betancourt still shows absurdly large career platoon splits. Betancourt has held righties to a .243 wOBA, while he’s allowed a .313 wOBA to lefties. Against lefties, his strikeout rate has gone down and his walk rate has nearly tripled. But he’s also generated grounders and done just as good a job of limiting dingers, and maybe that’s the idea. Lefties have had success against Rafael Betancourt, but they haven’t had success knocking him out of the park. It’s strange to see a guy with Betancourt’s pattern, and it’s strange to see a guy with Betancourt’s pattern and splits. You’d think Betancourt might mix things up to try to improve his success against lefties, since he’s been exploitable. Maybe he doesn’t trust his stuff, and in that event, maybe he’s right not to. 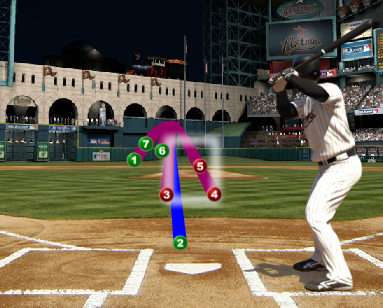 Clearly, there’s a reason that Betancourt keeps pitching like this. And it’s nothing short of mesmerizing that he does. We hoped you liked reading Rafael Betancourt Is Just Getting Laughable by Jeff Sullivan! I find him to be absolutely fascinating for reasons that might not appeal to the average baseball fan. Thought this would be a saber article on hat-tugs. I thought it would be about the number of times he touches his cap or the amount of time he takes in between pitches.